A policeman was flung into the air by a criminal driving a stolen car - then immediately got up and chased the offender on foot. 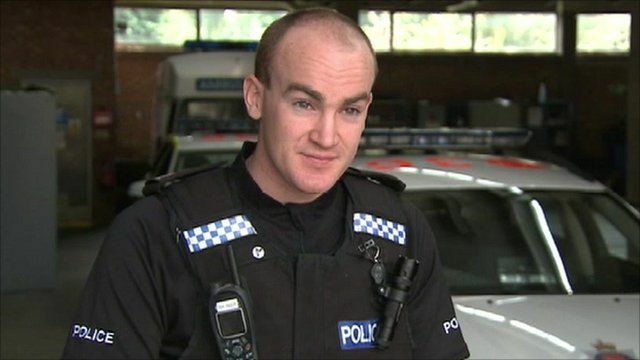 PC Dan Pascoe, of Surrey Police, used his Taser stun gun to stop Lee Adamson escaping before the officer collapsed from his injuries. Police had set up a road block on a slip road of the M25 at junction 11, near Chertsey in Surrey, to stop the stolen vehicle. Video footage shows the officer being thrown violently to the ground after his police car was rammed by a blue BMW driven by Adamson on July 3. Adamson, 29, from Hayes, west London, was jailed for 23 months at Guildford Crown Court on Friday. He pleaded guilty at an earlier hearing to dangerous driving, failing to stop at the scene of an accident, driving while disqualified, driving without insurance and resisting arrest. Insp Chris Colley, of Surrey Police, said: "Thankfully Pc Pascoe only sustained minor injuries."